'Au Coin du Feu' - 'by the fireside' was named with the 4-sided fireplace in mind which is a central feature of this magnificent chalet. It is of Genuine Savoyarde design and combines modern comforts with a warm rustic charm. We are surrounded by Alpine pastures with plenty of space and stunning views. Amazing treks right on the door step with lots of tips and advise by Francesca and Paul. Chalet 'Au Coin du Feu' - 'by the fireside' was named with the 4-sided fireplace in mind which is a central feature of this magnificent chalet. It is of Genuine Savoyarde design and combines modern comforts with a warm rustic charm. In winter we are on the piste and you can ski right to the door. Walk across the road to the main cable car directly opposite the chalet which links Morzine and Avoriaz. In summer we are surrounded by Alpine pastures with plenty of space and stunning views. Amazing treks right on the door step with lots of tips and advice by Francesca and Paul. Chalets Des Amis and Plan des Rochers are offered on a self-catered basis in the summer, spring and autumn. In winter the chalets are offered on a half board basis with an option for self-catering in January. The resort: Morzine is a picturesque alpine town lying, in the heart of the vast Portes du Soleil ski area and only an hour away from Geneva airport. Morzine is both lively, with many bars, restaurants and night clubs, and also has excellent facilities for children + families. The skiing covers 13 resorts with 228 ski lifts serving 650km of pistes, for all levels of skier. The Chilly Powder reputation has grown from the quality and variety of the cuisine, resulting from 10 years catering experience working in London, Dublin, Paris and Japan. We also offer self catering apartments and chalets at reasonable prices. 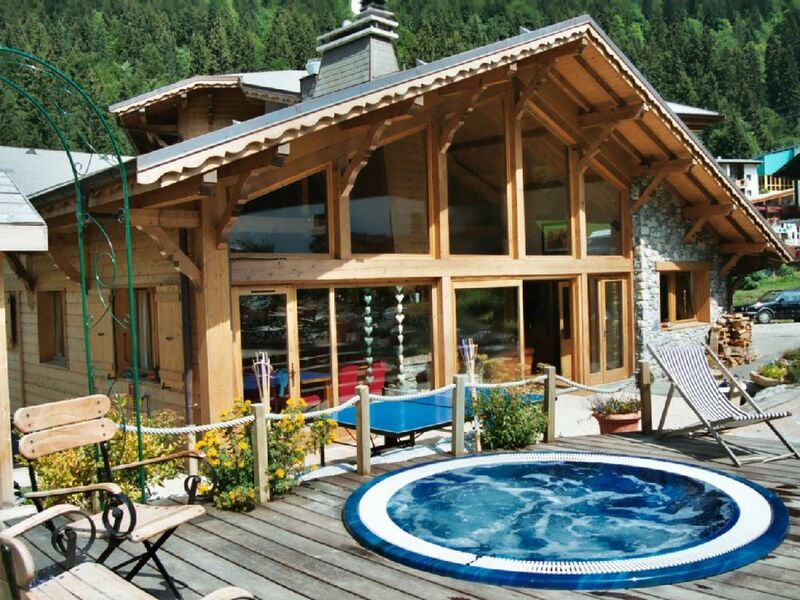 Summer: Morzine is one of the most popular summer alpine retreats in France. Sports include white water rafting, canyoning, rock climbing, hydospeeding, mountain biking, paragliding, high altitude trekking, and more. Less extreme sports include golf, tennis, horse riding and outdoor swimming pools and beautiful lakes for swimming. All sports are accompanied by one of our experienced staff and with qualified local guides. Lake Geneva is only half an hour away providing beaches, sailing, windsurfing and water skiing. Chilly Powder have been operating catered and self-catering chalet ski holidays since 1996. The genuine ski to the door location of our 6 luxury catered ski chalets with unrivalled in-house childcare facilities sets us apart from other ski chalets in Morzine. The ski pistes from Morzine Avoriaz descend straight into our back garden and the main cable car, just a very short walk from all 6 chalets takes you to the heart of Morzine Avoriaz skiing with the best access to the vast Portes du Soleil ski area. There are numerous catered ski chalets in Morzine but just a privileged few can boast a true ski to the door and on piste location. All bedrooms in every chalet have en-suite bathrooms, there is an outdoor hot tub, sauna and massage room and in-house childcare is provided in our own crèche. Our ski chalets are absolutely unique in Morzine for small or large groups or for individual families with children or babies. Our truly excellent food, friendly staff and relaxing atmosphere of our chalets make it the perfect winter holiday destination. For our many returning guests Chilly Powder it is considered a real home from home. Great atmosphere, excellent childcare and fantastic cuisine means that this is a REAL holiday for the entire family. We all had heaps of fun and came away rejuvenated and relaxed. Superb location ski-wise with easy access for skiiers of every level. We are going back this year to get our eldest on skis for the first time - apparently they even have a new fun park with beginner's lift set up just outside the chalet which will be the perfect introduction. You can't beat a family-owned and run place for attention to detail and genuinely warm welcome. The hosts are always one step ahead of your needs, full of positive energy and generous with the wine of an evening! I worked in exclusive travel for 5 years and I am very impressed with what is on offer. Golf: From May to October we operate Golf holidays. From Morzine we provide transport and accompany you to courses at Les Gets, Chamonix, Megeve, Annecy, Flaine, Avoriaz and the championship course at Evian. Play admits some of the most spectacular scenery in Europe. Cleverly designed and excellently maintained courses at altitudes up to 7000ft give breathtaking backdrops to every shot and add extra yardage to your tee shots. You can play as often as you wish or combine your golf with any of the other alpine sports on offer. Ski: Morzine lies in the heart of the vast 'Portes du Soleil' ski area, the largest in the world. With 650km of pistes and 220 ski lifts there is almost too many choices of where to ski. There is an excellent mix of difficult and gentle pistes to get you from A to B, and is ideal for groups of mixed abilities. The area has an excellent snow record and blends great skiing above and below the tree line. 25% discount for standard family rooms. 15% discount for Premier family rooms. Further 15% reduction for children in family rooms or 25% if in a twin room Half board possible in Autumn depending on numbers Meals included in the rental rates: Breakfast, afternoon tea & 5-course dinner including wine. All facilities free of charge.